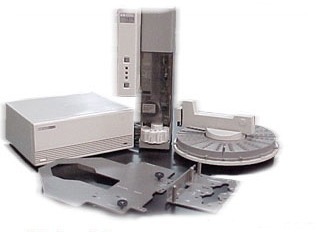 The HP 7673B Automatic Sampler is made up of three modules. The HP 18594B controller and communication module supplies power and communications to the injector and tray. The HP 18593B injector module removes a volume of sample from a vial and injects it into inlet using the fast injection technique. The HP 18596B tray module moves samples vials to and from the injector and the bar code reader. The HP 18587A bar code reader module is also available. It reads the vial numbers and special functions for running the method. It can also be used for agitating the sample vial. 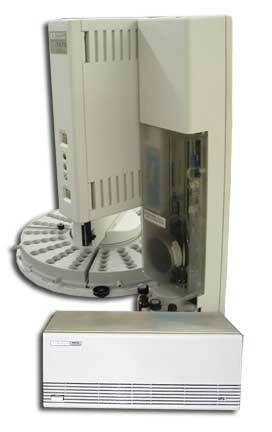 The automatic sampler becomes part of your gas chromatography system. It introduces sample to an inlet or a column on your gas chromatograph. Mounting bracket and HPIB (IEEE) communications available at extra cost. Trade in any type B controllers, towers or trays and receive 250.00US off for each.